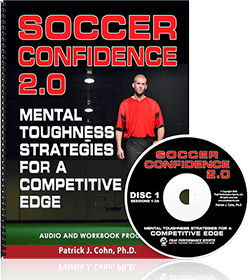 Your mental game in soccer is very important to success. One way to increase confidence, create a positive mindset, and develop composure is through visualization or mental rehearsal. 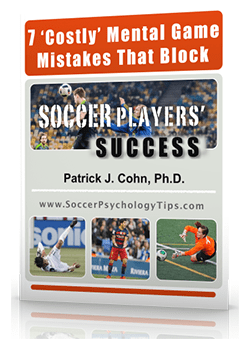 You can create any situation in your mind- a high-pressure penalty kick, a hard tackle, a breakaway. You might not always be able to set these up in practice, but you can through visualization. If you are a high level athlete, you have probably heard about the use of visualization, mental rehearsal, or mental imagery to improve performance. As a soccer player, you might wonder how visualization works and if you can improve your performance by merely imagining success. 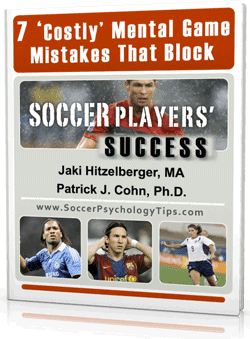 Most professional soccer players use visualization, but many miss out on its power. Some athletes think that if they are not sweating, and don’t physically practice with a ball at their feet, they can’t improve. We know that what you think about, see, or feel in your mind impacts your performance. You want to program your mind for confidence, focus, composure, and execution. How does visualization work for soccer players? When you imagine yourself performing at your very best, you activate the neurons that would fire if you were to physically perform the skill. You are programing your mind so that when you do perform, your mind has already practiced what you want your body to do. How to use mental rehearsal for soccer? Visualization takes time and practice to master, just like any new skill. Use your dominant learning style– Imagine sounds, smells, touch, and taste in addition to visual cues or how you like to learn and perform. These include the sounds of the crowd yelling, smell of the grass, feel of the ball at your feet, and taste the sweat. The more details you use while visualizing the better your subconscious will program it into your mind. Visualize from multiple points of view– While you visualize you want to take two different perspectives: The perspective of a bystander watching yourself, and also a first person view point (basically what you would see if you were actually performing). These two points of view will give you more information and increase the quality of your mental images. Your visualization should be positive– See yourself doing what you want to do and performing your best. Imagine your shots are powerful and driven to the corner net, your speed as you push the ball past and defender and slot the ball in on a break away, your tackles are hard and solid on defense etc. Make it a consistent part of your routine– Top-level soccer players commit to using visualization everyday for at least 5-30 minutes. You will also benefit from using visualization before games to mentally prepare for your performance. 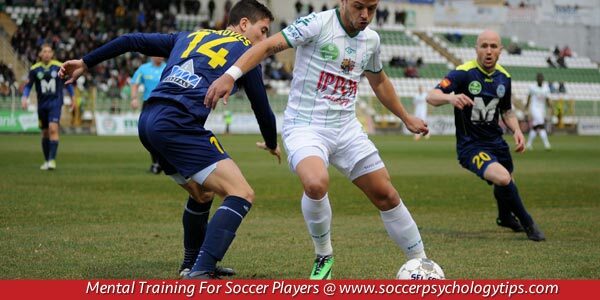 At Soccer Psychology by Peak Performance Sports, we design custom imagery programs to help you rehearse mental skills and get the most of visualization. Contact us today if you are interested in working with a mental coach at Peak Performance Sports or want more details about custom imagery programs.